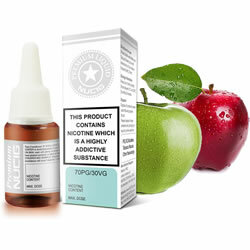 Try our Blue Label Apple eliquid flavour, it is a perfect blend for the perfect vaping experience. 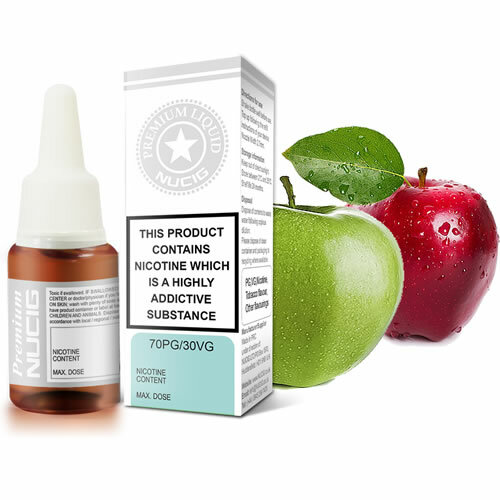 NUCIG Blue Label Apple eliquid contains only the purest and highest quality pharmaceutical grade ingredients and is for those who prefer extra throat 'hit' and 'kick'. Exclusive MaxVol™ technology delivers a smoother, richer maximum volume smoke (vapor), providing a satisfying fresh Apple flavour. Specially formulated to extend the life of your electric cigarette atomiser, clearomiser and tank. Lovely scent of apples, pleasant all day vape. Lovely falvour - Apple Eliquid. Easy to dispense with very satisfying vape. I have tried various other brands of apple but I must confess this version from NUCIG is perfect. very light, good refreshing flavour and lots ad lots of sumptuous vapour/smoke.